The Shift Record identifies recurring and consistent shifts. 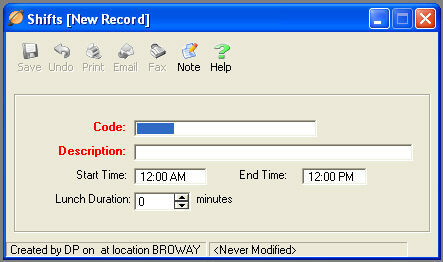 The Shift Record defines the Start Time, End Time and Lunch length of a Shift. Code : Enter a Code for the Shift Record. The Code cannot contain any spaces or special characters. Description : This field is used to further describe the Shift. Start Time : Identify the starting time of the shift. End Time : Identify the ending time of the shift. Lunch Duration : Identify the length of the lunch.